Enjoy a country holiday in Picardy, 15 min. from Amiens, less than an hour from the Baie de Somme. 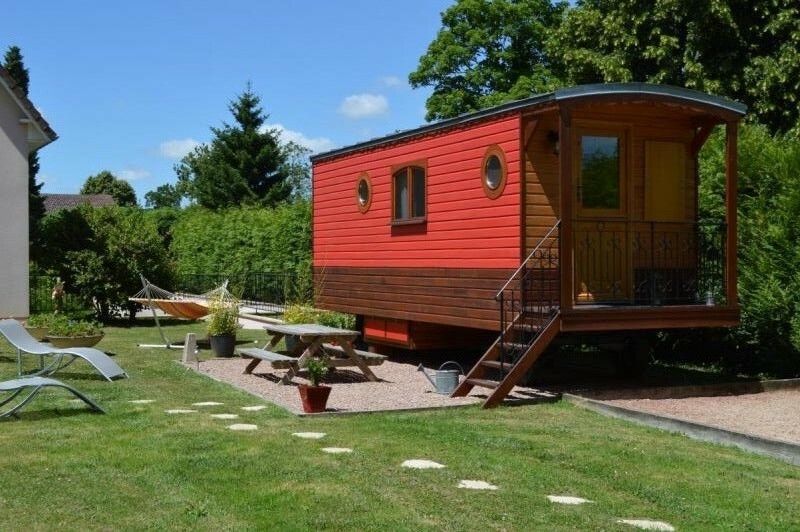 'Les Pieds dans l'Herbe' is a gypsy caravan, near owners' house, in 2,000 sq.m. wooded garden in flower-decked village (France in Bloom award winner). Kitchen area (fridge, dual ceramic hob, combination oven), shower room/WC, alcove (queen-size bed), double bench bed, extra bed (70cm wide). Outdoors: garden furniture, BBQ, boules pitch, table tennis table. Electric heating (cost included in rent). Private parking. Can be rented by the night: from 80€. Reduced rate for longer stays (contact owners for details).